Expert tip: This is one of the most popular yoga retreats offered in Colombia. If you want to learn how to practice Meditation, or deepen your practice while stepping away from society and stress, spend a marvelous week at La Casa de Loto. 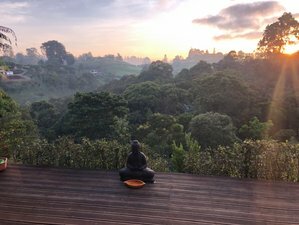 This non-religious meditation and yoga retreat center, where all retreats are under the guidance of Karma Pema Tsering, is located high up the magical Colombian mountains. Here, you will focus on Samatha and Vipassana Meditation, and enjoy daily guided meditations, yoga classes, question and answer rounds, freshly cooked organic food, and other optional activities in a nourishing environment surrounded by nature. La Casa de Loto offers you a home away from home and a beautiful, nourishing simple environment in which to cultivate a peaceful awakened mind. The center is open all year round to guests of all race, color, religions, and countries who want to embark or deepen on a journey to the inside. All retreats are guided by Karma Pema Tsering, a certified Hatha Yoga Teacher, and a scholar and practitioner of tibetan Buddhism and Zen. He lived and studied in various buddhist temples around the world, and teaches in a modern, non-dogmatic way. His emphasis is on the ancient practice of Samatha (calming the mind), Vipassana (insight into the true nature of reality), yoga asanas (postures), Pranayama (breath work), analytical meditation and to teach you how to include these practices into your daily lives, so you can become more relaxed, loving, and conscious - and make a change in this world. Visitors from all over the world come here to attend courses and enjoy the spiritual atmosphere of the place for study and practice. Absolutely everyone who isn´t scared of animals, silence and nature is welcome. certified yoga teachers with at least three years teaching experience, who want to learn well the art of Meditation, can apply as volunteers. La Casa de Loto's aim is to teach you how to embark on or deepen your spiritual life with a clear path, how to practice, how to advance in your practice, and how to integrate it into your daily life. The teachings are mainly based on the ancient Buddhist and Vedic practices of Samatha meditation (calming the mind), Vipassana meditation (insight into the true nature of reality), yoga asanas (postures), and pranayama (breathing exercises). To support your stay and help develop your inner growth, La Casa de Loto also implies a practice of noble silence for some days each week, which is very helpful for the cultivation of a peaceful mind. Any doubts can be cleared up in the daily question and answer rounds that take place after the guided meditation. ​Each Sunday, La Casa de Loto receives visitors from all over the world to attend its week or month-long retreats and enjoy the restful, rejuvenating, and spiritual atmosphere of its surroundings. Absolutely all who want to learn how to practice, or deepen their practice, are happily welcome to join. Tibetan or Hatha yoga is an old system that includes the practice of asanas (yoga postures) and pranayama (breathing exercises), which helps bring peace to the mind and body, preparing us for deeper spiritual practices such as meditation. At La Casa de Loto, we focus a lot on the breath, trying to create a flow of energy during the classes to help release mental and physical blockages. Yoga here is on the spiritual side of it more than the physical one. It is instructed mostly by Mauricio. He teaches yoga for over 20 years now and lived on solitary mountain retreat dedicated to practicing for ten years. You will allow silence and the calmness to penetrate your flesh and bones. You will allow the energy of mindfulness to penetrate your body and mind. You will walk, meditate, read, write, study, or do anything else that pleases you, in silence. All will be done with pure awareness of just this one task. You will breathe deeply and enjoy the stillness and the freshness. You will stay alone outside with the trees, the river, the lake, and the animals, go for walks, or use the rooms to relax. It is needed that everyone participates in this practice for it to be deep and joyful. The lamrim or the “graduated path” is a presentation of Shakyamuni Buddha’s teachings that details the stages in the complete path to enlightenment. In the single-pointed Lamrim meditation, you will focus your mind on one single object at a time and walk through the various stages to liberation. Lama Zopa Rinpoche has recently given new advice suggesting that students follow a lamrim outline and meditate on each subject for two weeks or one month until all subjects have been completed. Rinpoche advised “The amount of time for meditation is up to the individual, but the general advice is to finish the lamrim in one year”. Depending on the duration of your stay, you will be introduced to one or various meditations and teach you how to continue this beautiful path. Pema is a Iyengar yoga, and Buddhist meditation practitioner and teacher. He lost both of his parents early in his childhood, and all of the wealth they had left for him by will, was stolen by others in his family in his teenage years. This situation led him to the edge of suicide. But just a moment before taking his life, Pema gained insight into the nature of being, and understood that all good and bad is equally just projections of the mind. Instead of taking his life, he became an adept Yogi. His main teachers are The Dalai Lama, Dudjom Lingpa, Lobsang Dawa, and Losang Sherab Sherpa. This retreat will take place in Medellin, Colombia. The center is located just an hour away from Medellin City and 45 minutes from Jose Maria Cí³rdova International Airport (MDE). During this retreat, you will be served three daily locally sourced, delicious meals, and a snack for teatime. The food will be vegetarian and organic. There are a few optional therapies available at additional charge. The Ayurvedic massages are available for 160.000 COP and the Reikis for 85.000 COP. The Ayurvedic massage is a key part of the Ayurvedic therapy. Just as a machine needs to be oiled, the body loves to have its largest organ, the skin, soothed, which is the reason oils are used in this massage. Whether the Ayurvedic massage forms part of a more comprehensive Ayurveda programme or is merely undertaken for the sheer pleasure of a deeply relaxing, indulgent body massage. The Ayurvedic massage is one of ancient India’s best-kept secrets. Over 5,000 years of empirical research has refined Ayurvedic massage into a sublime art and yet it is still unheard of by many. However, combining skilled knowledge of the body with the knowledge of oils and bodywork techniques has resulted in a profound art for balancing the body and the mind through the medium of oil massage. Its calm approach means that the recipients are not only induced into a relaxed state during the massage but they also often report an improvement in their sleep patterns and a general sense of wellbeing. In an ideal world, Ayurvedic massage would be carried out daily to help keep at bay the effects that everyday stresses and strains can have on our minds and bodies. Carlos, a great Ayurveda therapist, studied these techniques in India and Barcelona and practices for many years. Reiki is a Japanese technique for stress reduction and relaxation that also promotes healing. It is administered by "laying on hands" and it is based on the idea that an unseen "life force energy" flows through you and is what causes you to be alive. If one's "life force energy" is low, then you are more likely to get sick or feel stressed, and if it is high, you are more capable of being happy and healthy. The word Reiki is made of two Japanese words, Rei, which means "God's Wisdom or the Higher Power" and Ki which is "life's force energy". So Reiki is actually "spiritually guided life force energy". A treatment feels like a wonderful glowing radiance that flows through and around you. Reiki treats the whole person including the body, his emotions, the mind, and spirit creating many beneficial effects that include relaxation and feelings of peace, security, and wellbeing. La Casa de Loto is a Mindfulness Meditation and Yoga Retreat Center to reconnect with yourself and nature. This vacation is available all year round from January to December, with arrival on Sunday.